18-19/03/2019: WMO meeting ‘Ad Hoc Expert Team on Meteorological Services on Land Transportation’ at Geneva, Switzerland. Further information and related documents can be found here. 19/02/2019: European Freight and Logistic Leaders’ Forum (F&L) webinar ‘Climate change: how can we safeguard supply chains and ensure security of supply for customers?’ The whole webinar can be watched on Youtube. Mag. Dr. Matulla’s presentation can be seen here in detail. 29/01/2019: BMNT Wien: Final presentation of the three master theses to the heads of the departments ‘Schutzwasserwirtschaft’ and ‘WLV and Schutzwaldpolitik of the BMNT. The whole presentation can be found here. 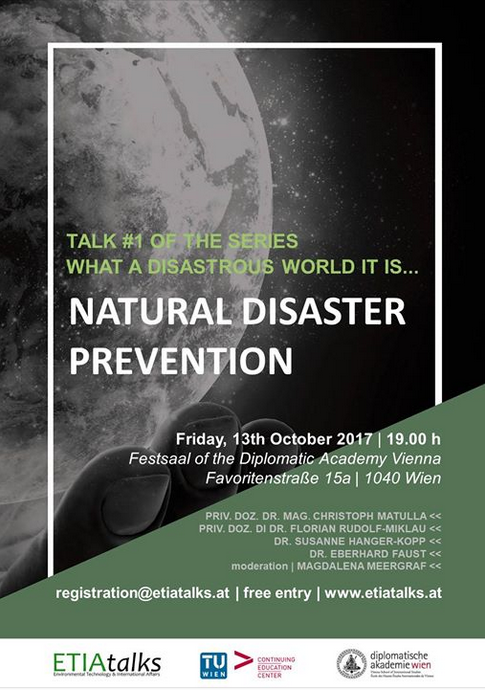 31/10/2018: Master-Seminar at the University of Vienna – Katharina Enigl, Andi Mansberger and Fabian Frank gave their final presentation concerning their scientific projects. 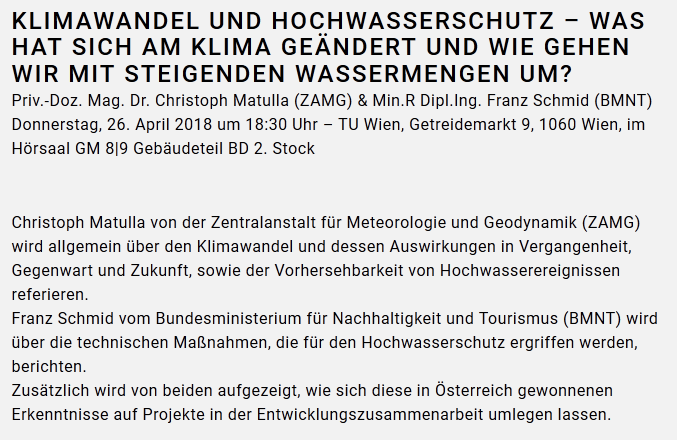 08/05/2018 Zürich, MeteoSWISS : trilateral meeting of national weather services – Germany (DWD), Austria (ZAMG) and Switzerland (MeteoSWISS). Many constructive, very motivating discussions – there are actually lots of cuts for the development of synergies :-). 26/04/2018 TU Wien, Ingenieure ohne Grenzen (IOG): MR. Dipl.-Ing. Franz Schmid (BMNT) and Christoph Matulla gave a presentation on Climate Change induced risks concerning floodings and how lessions learned in Austria (e.g. HQ100 in 2002 and 2013) may be implemented in various other regions of our world (announcement). 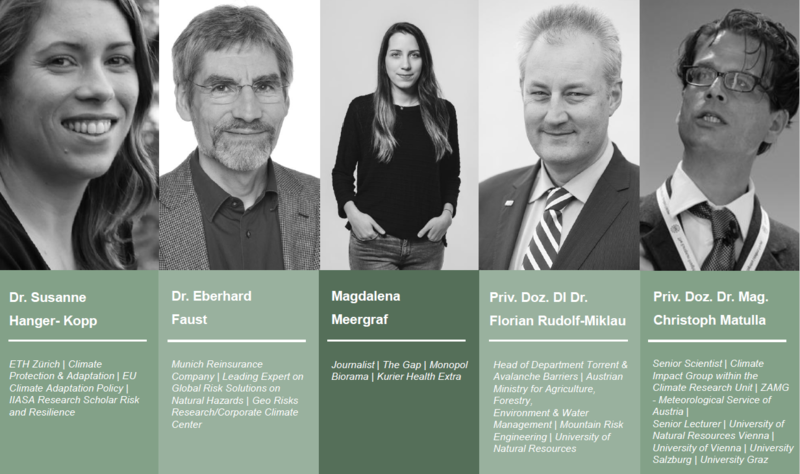 IOG is an organization worth to know and it is interesting to follow their activities around the planet.Our presentations may be found here : Climate Change, Risks and floodings and floodings in Austria, lessions learned, Risk management and hands on Information. 12/11/2008; 5. NÖ Katastrophenschutzfachtagung Tulln/AT: Unwetter im Sommer, Orkane im Winter – Ist das schon der Klimawandel? 04/11/2008; GKSS Research Centre, Geesthacht (announcement): Do we already see the climate change signal in European storminess? 02/03/2005; FishClim BOKU/AT: Beurteilung der Auswirkungen möglicher Klimaänderungen auf die Fischfauna anhand ausgewählter Fließgewässer (pdf) (co-authored by: Schmutz, S.; Melcher, A.; Gerersdorfer, T.